I love it when I have a little heads-up on an upcoming community event. Now usually these advance notices come through friends, but this time it came through an unusual source - the youngest Intrepid Junior Blogger. She came home from school one day quite pleased with herself, and when I asked why she explained she had been asked to serve on a committee. What committee, I wondered? 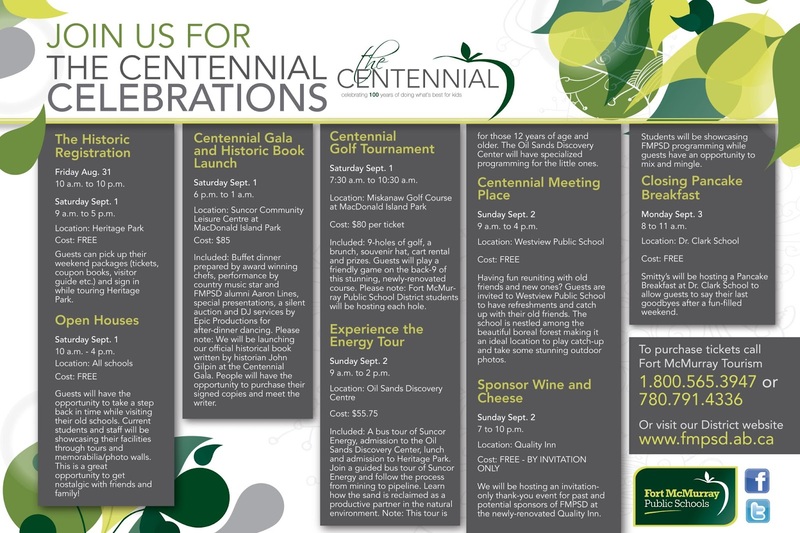 Well, the committee organizing the centennial celebrations for the Fort McMurray Public School District. She had been asked to serve as the student representative for her school, and explained that the FMPSD was looking to the current students for ideas and assistance. She wouldn't give me details, though, explaining that it was super-secret and me, being both media and her mom, was not going to get any information out of her until it was officially released (she's a cagey little thing, that one, and as one friend drily remarked "that particular apple hasn't fallen far from the tree"). Then a couple of weeks ago I received an email asking if I would grant permission for her to attend a press conference regarding the centennial. Since I was hoping I'd get an invitation too I not only agreed to have her attend I offered to drive her down (once again hoping for the inside track on the celebration from a child who would surely spill the beans at some point, right? Wrong, sigh). And that's how yesterday she and I ended up at the Clearwater Public Education Centre for the press conference announcing the 2012 Centennial Celebrations for the FMPSD - and when I finally got my hands on the details it looks like one helluva party, people. It's a bit hard to imagine the public school district is now 100 years old, but it is. So many think of this as a very young community, and in some ways it is, but in other ways we have a history that stretches back a very, very long time. It's a history that encompasses trappers and traders and our aboriginal residents, and, yes, a school district that has been providing education for 100 years. To put it into perspective as Dennis Parsons, Superintendent of the FMPSD said yesterday, 1912 is when the Titanic sank. 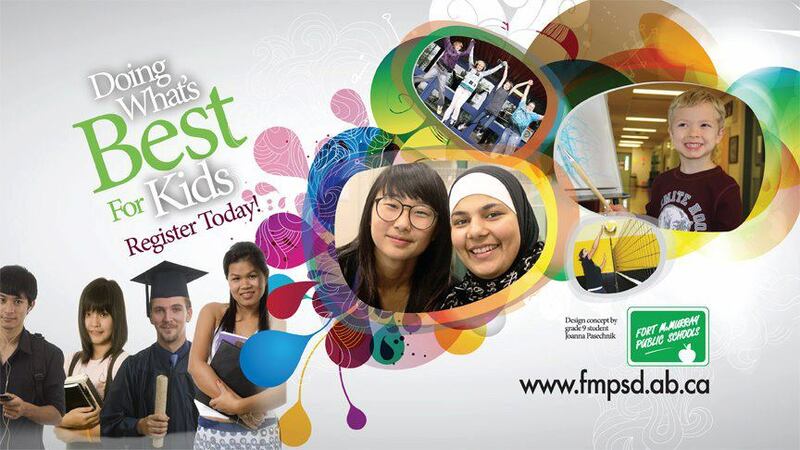 That fact astonished me a tiny bit as that seems a very, very long time ago indeed, but that's when the FMPSD began. 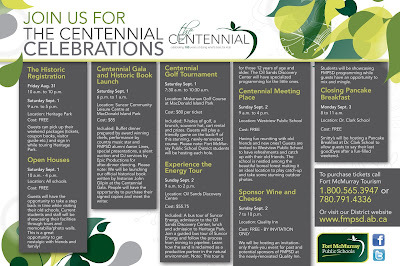 The Centennial Celebration launches on Labour Day weekend, from August 31 to September 3. There will be a pancake breakfast, school open houses, a golf tournament - and, one of my favourite things, a huge gala featuring Fort McMurray's own Aaron Lines (and he is an FMPSD alumni, too). At this gala they will launch a historical book about the FMPSD written by historian John Gilpin, and I am sure it will be a fascinating read. As the press conference went on yesterday the Junior Blogger kept nodding her head as events were detailed, since she was in the know about it all. She was quite delighted that I, as media, was hearing all this for the first time when she knew about the upcoming celebration and had even had input into the ideas that are now being realized. When the press conference finished she even told me to "stay put" as she had interviews to attend to (and was interviewed by both Shaw TV and a newspaper reporter, to her delight). Apparently the interviews went well, and I suspect she handled them with the kind of professional aplomb that would leave her camera-and-microphone-shy mother in the dust. 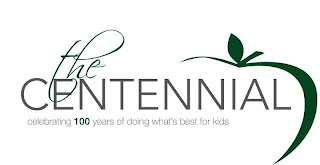 The theme of the Centennial Celebration is "Paint the Town Green", in honour of that colour you see on the FMPSD logo (and, as the observant Junior Blogger and rising spokesperson pointed out, the colours found even in the room we met in yesterday). So, the centennial celebration is really a big party - but it is what it is celebrating that is important. This is the one hundredth birthday of an incredibly important institution in our community. Thousands of children, including my own, have passed through the doors of the public schools in our city. Those schools offer not only education but a micro-community, too, a small family inside our larger community of Fort McMurray. For many years I have served as an active member of school councils and parent associations, and I have gotten to know many of the teachers, students, and staff in our schools. I have found the schools to not only be professional but also personal, a place where learning takes place, but not just learning of the academic sort. There is social learning, too, and learning to be not just a "student", but to be a "citizen". Schools are primarily meant to be places of education, it's true, but in my experience they are so much more. They become community, and in many ways they become family. I can't imagine a better reason to celebrate, Fort Mac. expresses her thanks for including her, too!